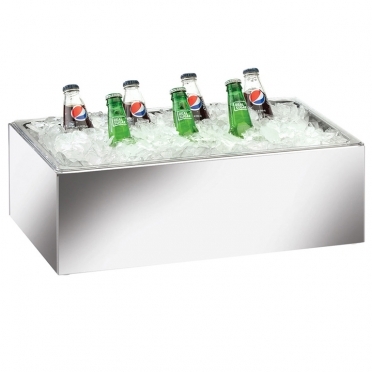 When you need a place to keep your beverages cool, this "Mirror Cold Ice Chafer" offers space for bottled soda, beer, and wine coolers. 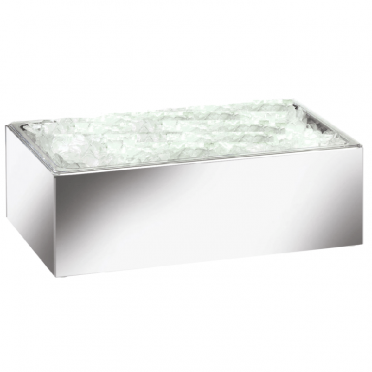 Its sleek mirror-finish is much more elegant than a regular cooler, and the open construction allows guests to view all the offerings and make selections with ease. Besides drinks, this chafer provides a stylish way to display fruit, parfaits, and seafood. No matter if you are hosting a Mother's Day breakfast or buffet dinner, this unit can be used inside or outside without hassle.